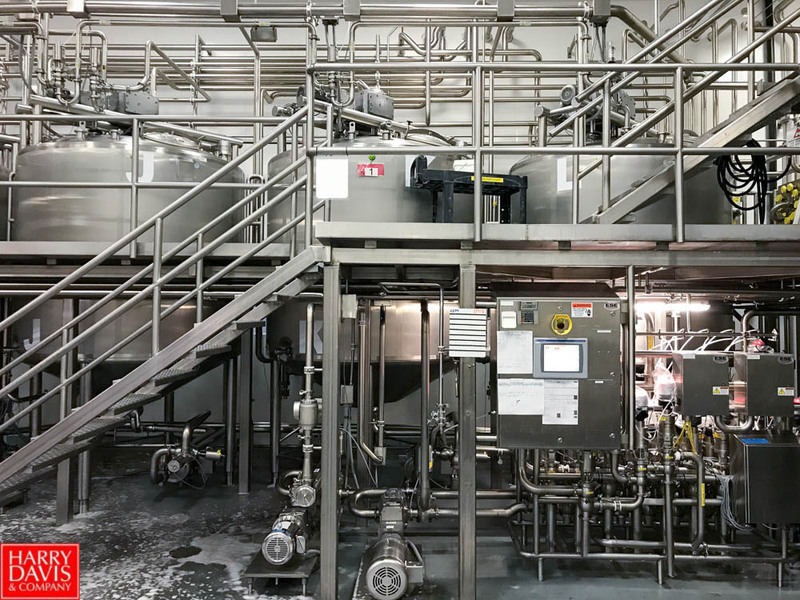 Complete, State of the Industry Modern Yogurt Plant. (2) Walker 25,000 Gal. 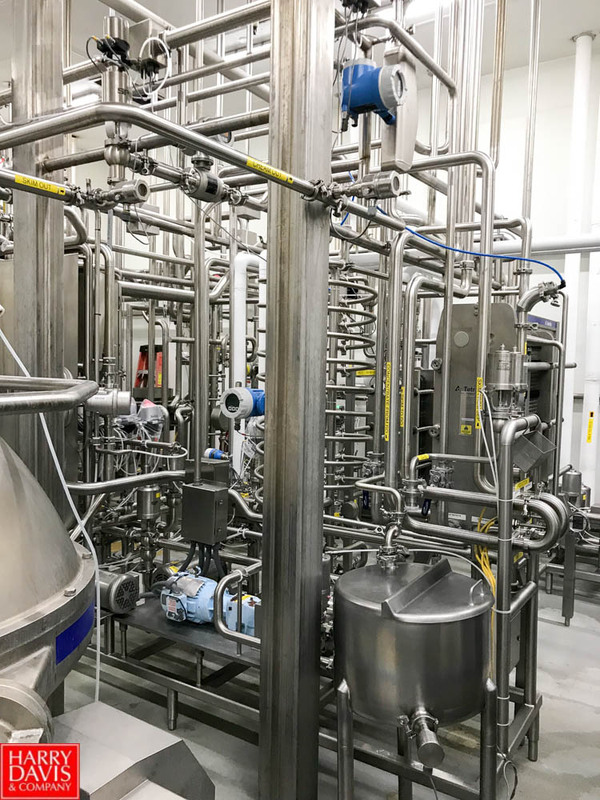 Vertical Jacketed Silos with Horizontal Agitators, Level and Temperature Sensors, and Waukesha Tank Inlet and Outlet Valves. (2) Walker 12,000 Gal. 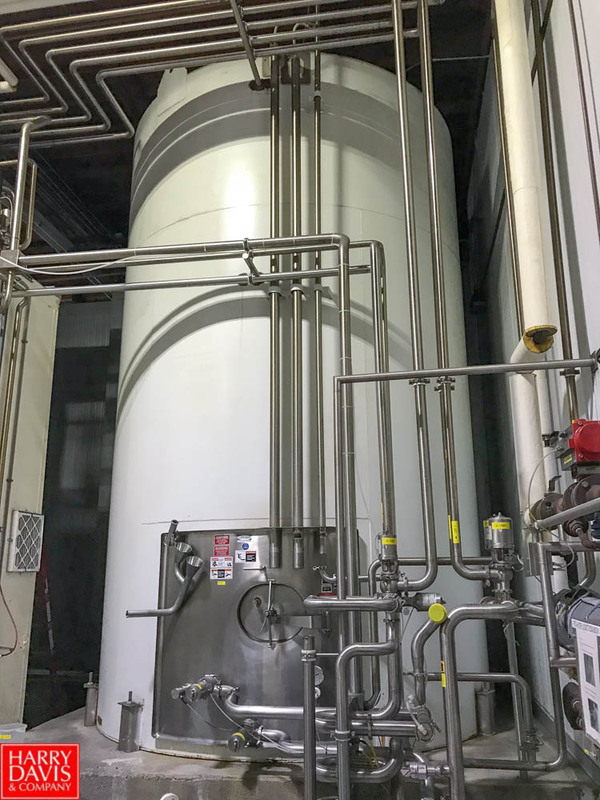 Vertical Jacketed Silo with Vertical Agitators, Level and Temperature Sensors, and Waukesha Tank Inlet and Outlet Valves. (2) Walker 6,000 Gal. 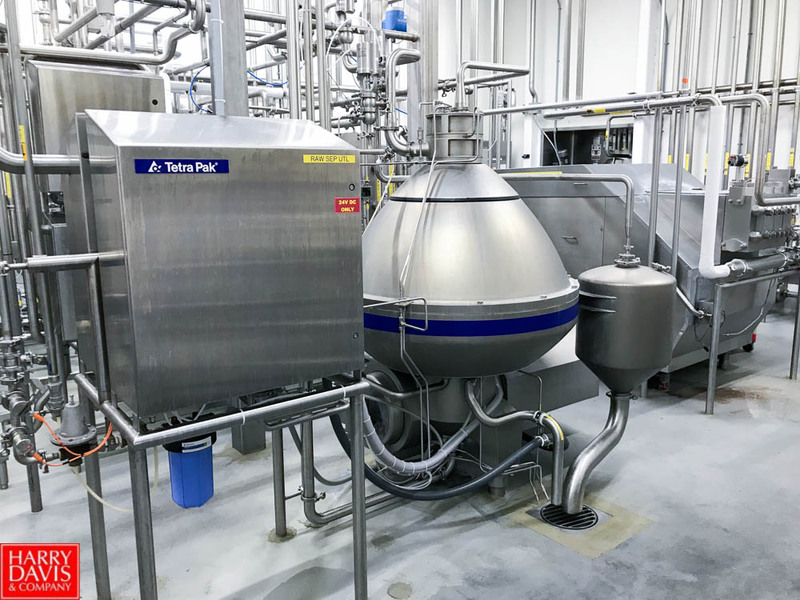 Vertical Jacketed Silo with Vertical Agitators, Level and Temperature Sensors, and Waukesha Tank Inlet and Outlet Valves. 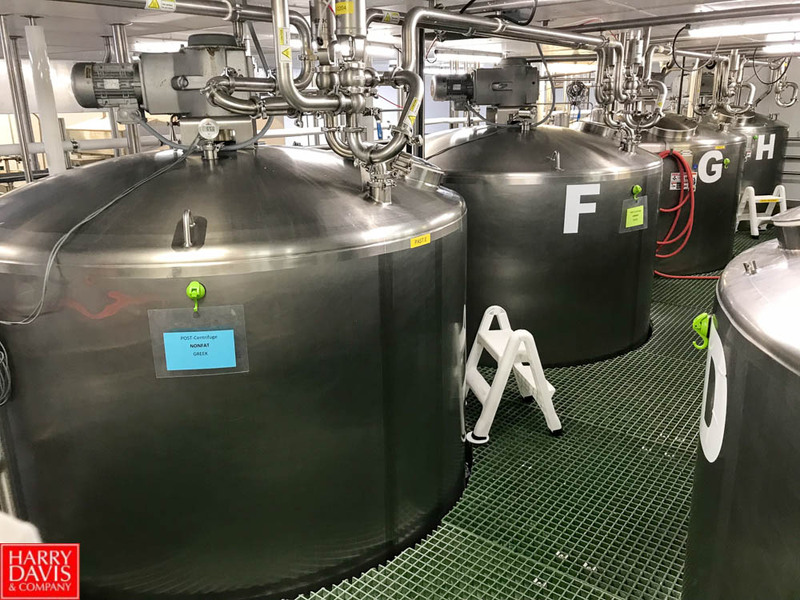 (6) 2017 Walker PZ-CB-K 4250 Gal. 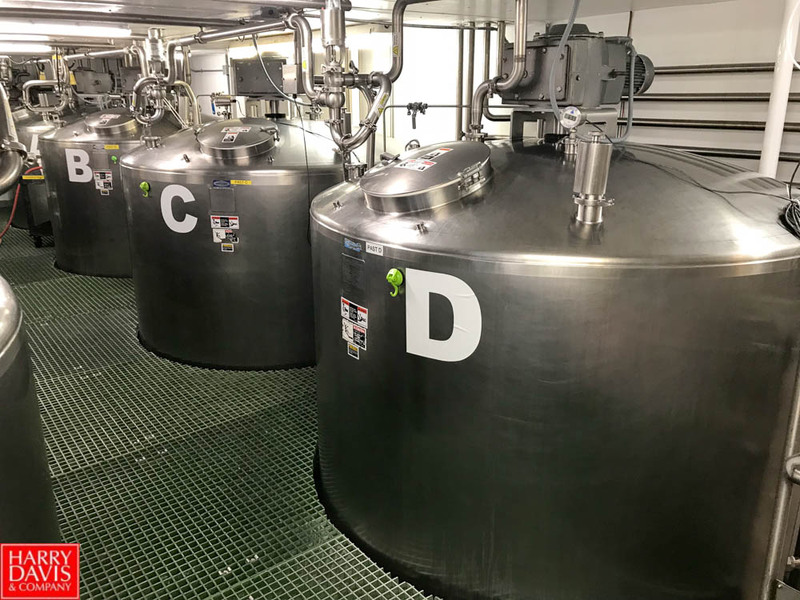 Vertical Jacketed S/S Processing Tanks with Scrape. Surface and Turbine Agitator, Cone Bottom and Leak Detect Outlet Valve. (12) Walker 1,800 Gal. Vertical Jacketed S/S Processing Tanks, Model: PZ-CB with Scrape. Surface Agitator, Cone Bottom and Leak Detect Outlet Valve with Pumps, Valves, Flow. 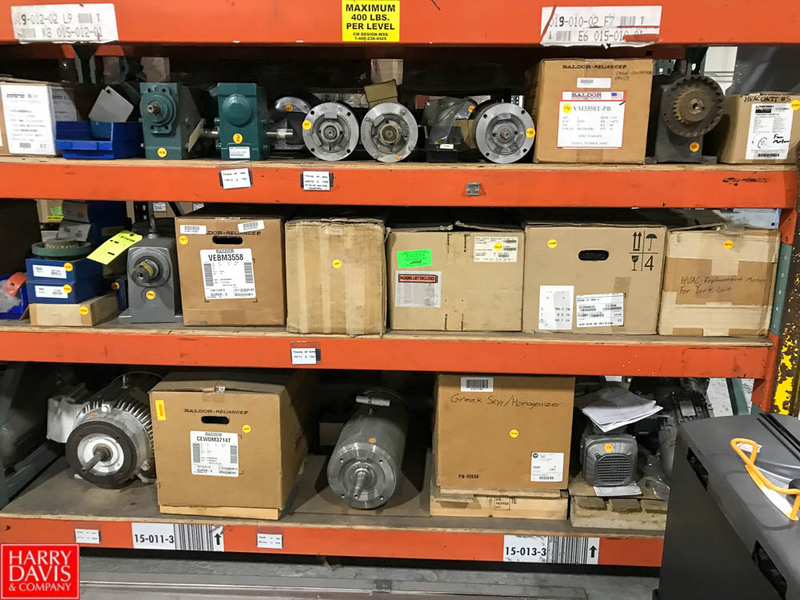 Meters, RTD’s, S/S Piping, etc. Sprinkman 300 Gal. 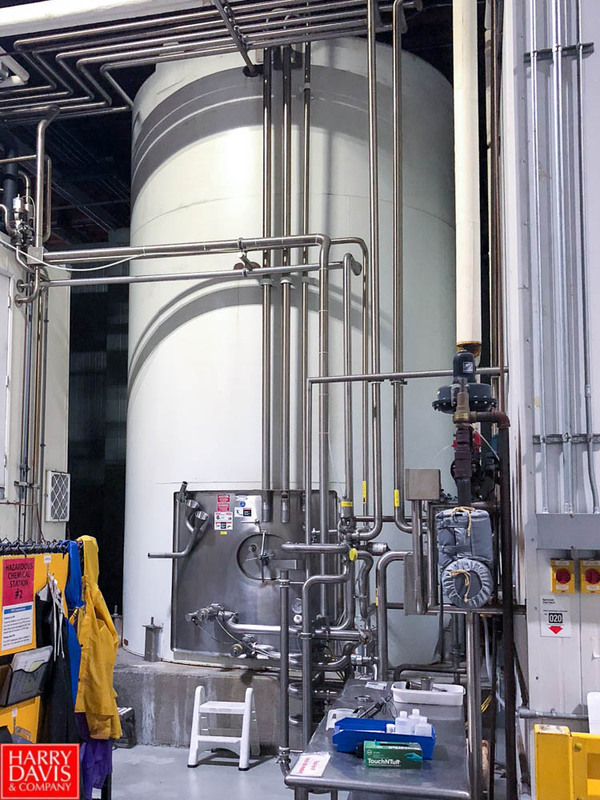 Vertical Jacketed S/S Processing Tank with Scrap Surface Agitator, Cone Bottom, Leak Detect Outlet Valve, and Pipe Ladder with Rest Platform; Sprinkman 700 Gal. 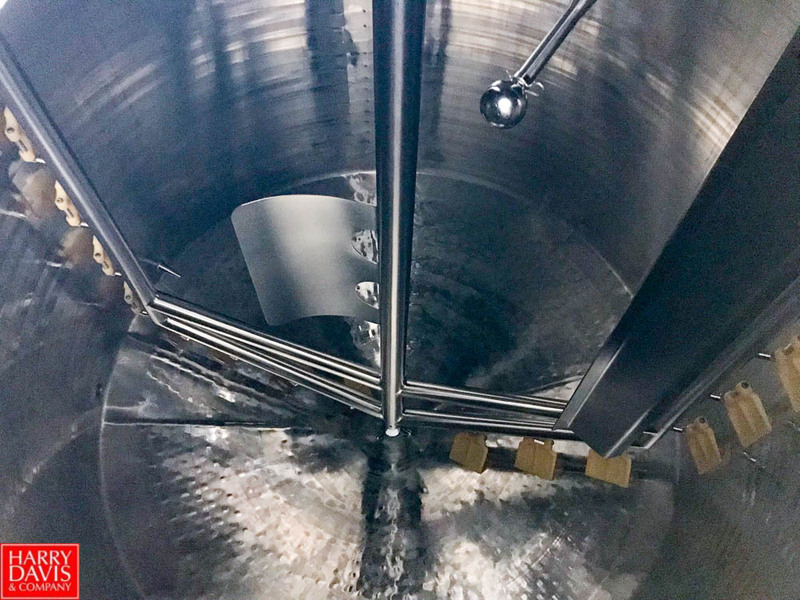 Stainless Steel Vertical Recovery Tank. (30) SPX WCB S/S Centrifugal Pumps. (20) SPX WCB S/S Positive Displacement Pumps, Models: 130U2, 60U2 & 18U2. (100’s) WCB Mix Proof & Other S/S Air Valves. Flowverter with (3) 3″ Sanimatic Straight Line End Inlet Strainer Assemblies, Kpatent Inline Refractometer, Kenics 3 KMR-SAN- 6 Inline Static Mixers. 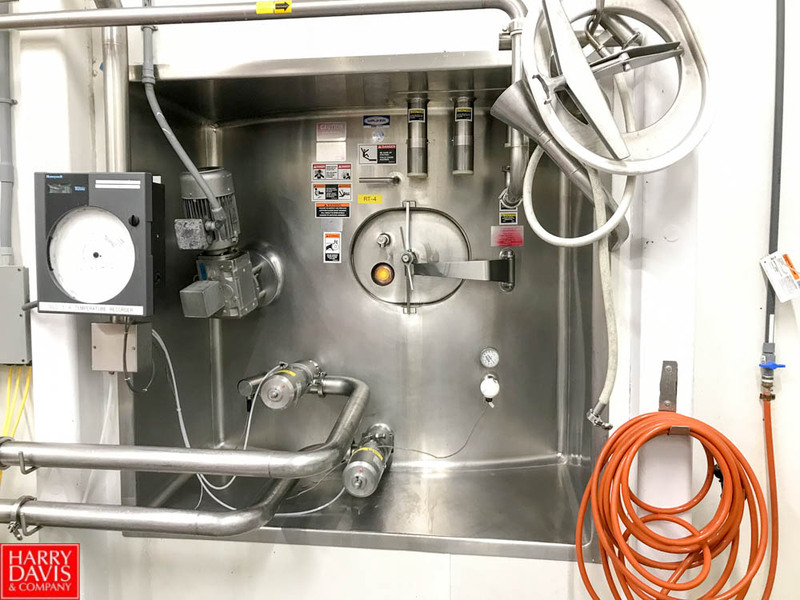 (2) E+H Flowmeter, SaniMatic Angle Line End Inlet Strainer, Kpatents Inline Refractometer, Admix 17.3″ OAL 6 Element 2″ Sanitary Static Mixer and Blender. 2017 Alfa Laval C30 8000 Gal./Hr. 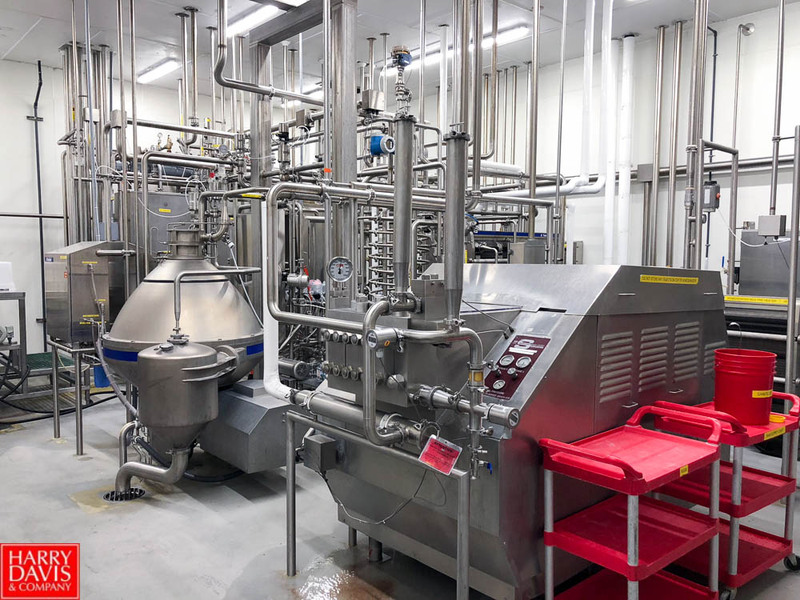 Cold Milk Separator with Control Panel, VFD, Spare Motor, Tetrapak C6-SH Plate Heat Exchanger, Cream Heat Treating System including Balance Tank, Level Indicator, Waukesha 2045 and (2) 2065 Centrifugal Pumps, Waukesha Valves, Control Panel, Waukesha 030U2 Positive Displacement Pump, Tetrapak C6-SH Cream Heating and Cooling Plate Heat Exchanger, and Tube Heat Exchanger Skid. 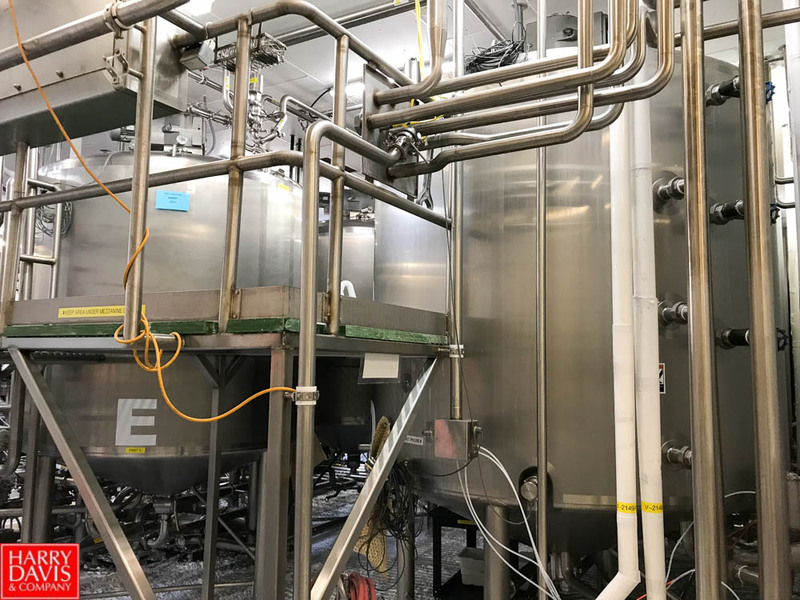 2011 GEA Westfalia Soft Cheese KDB 30 Separator with Valve Skid, CIP System, Tube Heat Exchanger, Dual Tetrapak C6-SH Plate Heat Exchangers for Preheating and Cooling, 150 Gal. 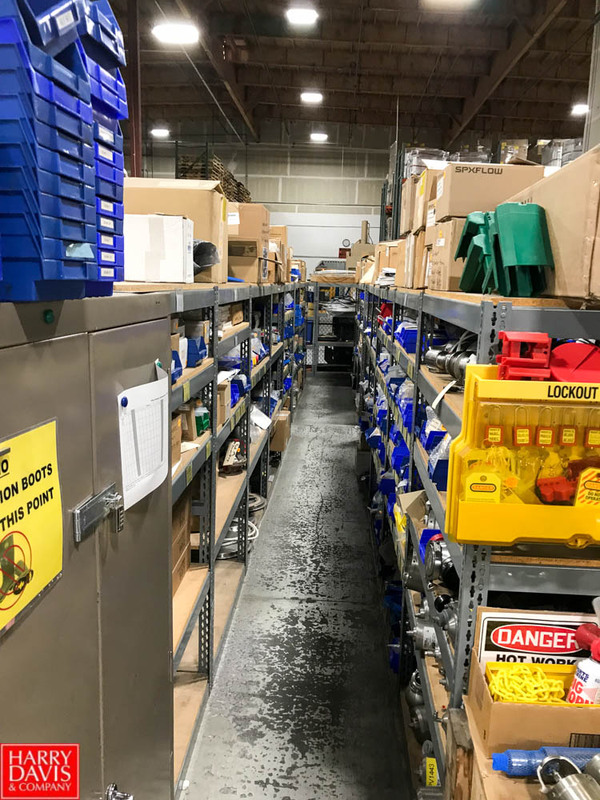 Surge Tank, Rotork Smoothing Valve, Control Panels, Waukesha 2045, 2065, 2085 Centrifugal Pumps, and Waukesha 130U2 Positive Displacement Pumps. Filtration Engineering Reverse Osmosis (RO) System (50 Gal./Min. 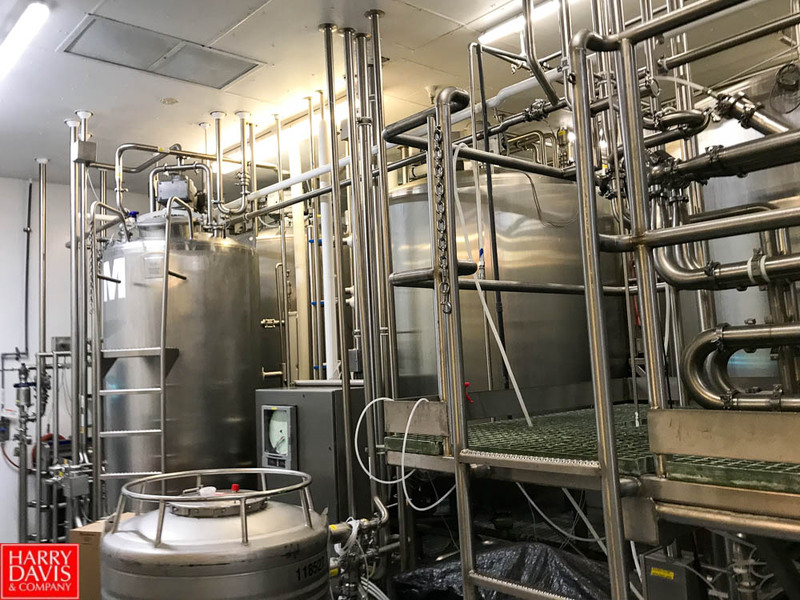 capacity) with 3 Loops, Feed and Concentrate Tanks, Alfa Laval LKH-25 Pump, Fristam FPX174-205, FM312-175, FM312-150 Pumps, Waukesha 2045 and 2065 Centrifugal Pumps, E+H Flowmeters, Turbidity Sensor, and CIP System with Tube Heat Exchanger. 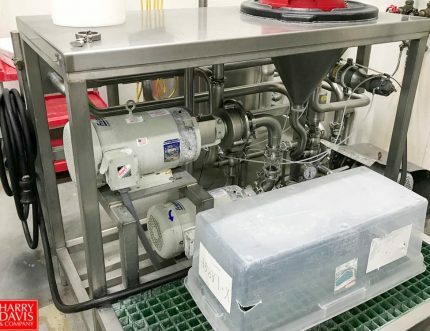 Fristam Powder Mixing System with Balance Tank, Fristam FS 3522 and FZX 2150 Pumps, and Waukesha 2065 Centrifugal Pump. 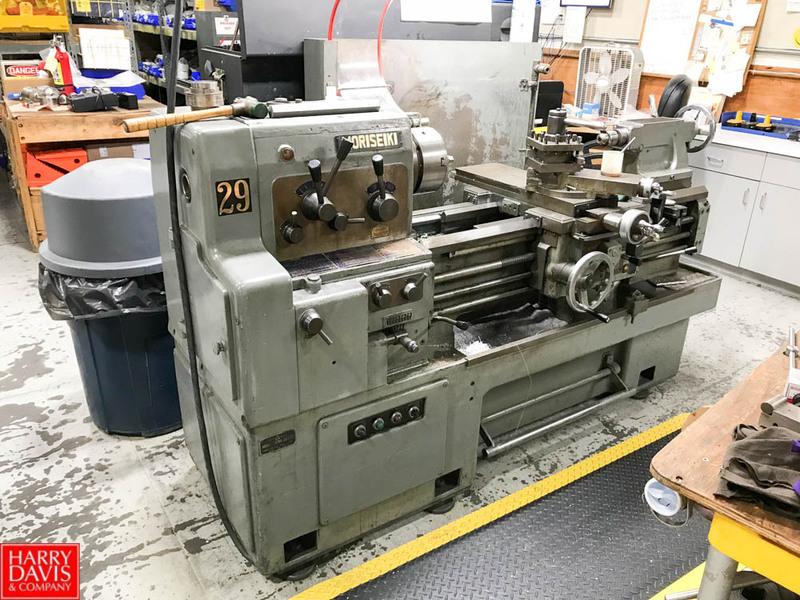 Blends more than 150 Lbs./Min. at 50 Gal./Min. Lightly Used. 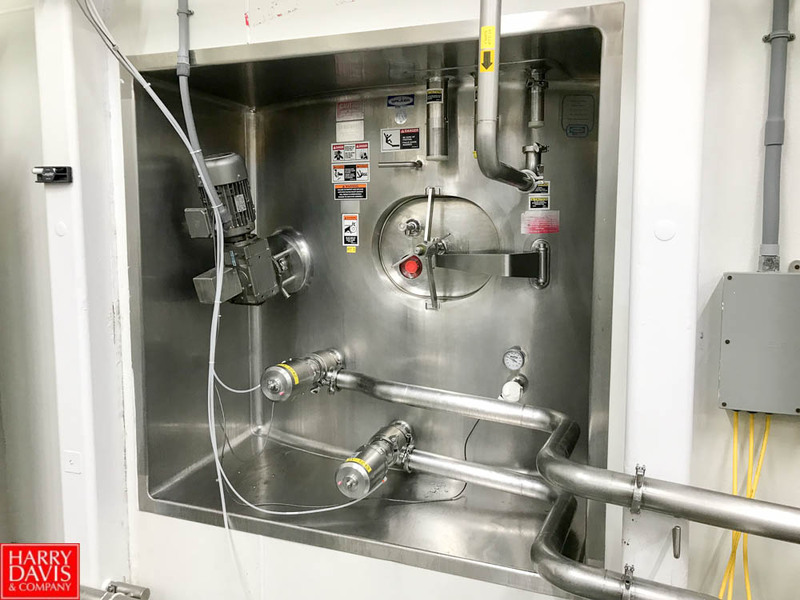 Rebuilt APV Homogenizer Model: MS45-3TPS, 2 Stage, 3 Cylinder, Tapered Poppet Valve Spring with Allen Bradley Powerflex 400 VFD and Spare WEG 75hp Motor. 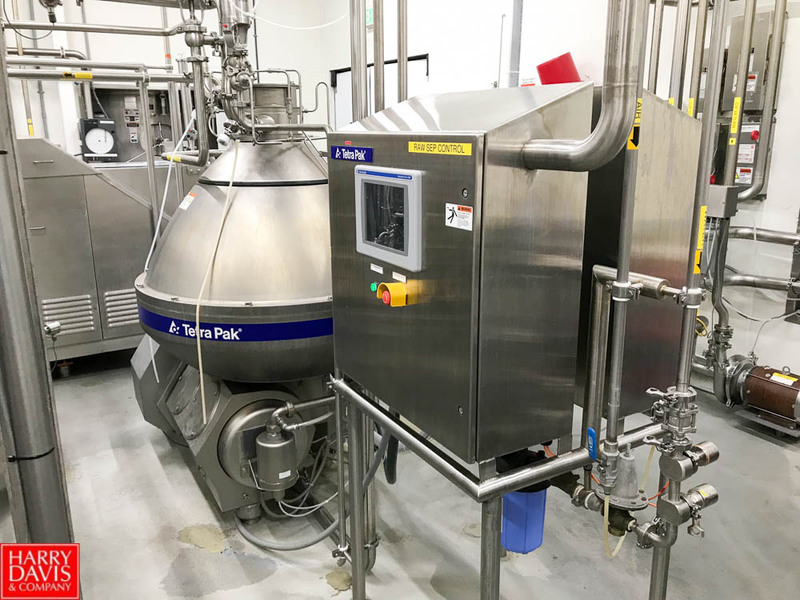 Tetra Pak Cream Pasteurizer with Tetra C6-SH Plate Heat Exchanger, Holding Tube, Balance Tank, Pumps, Valves, Hot Water Set and Allen Bradley Controls. 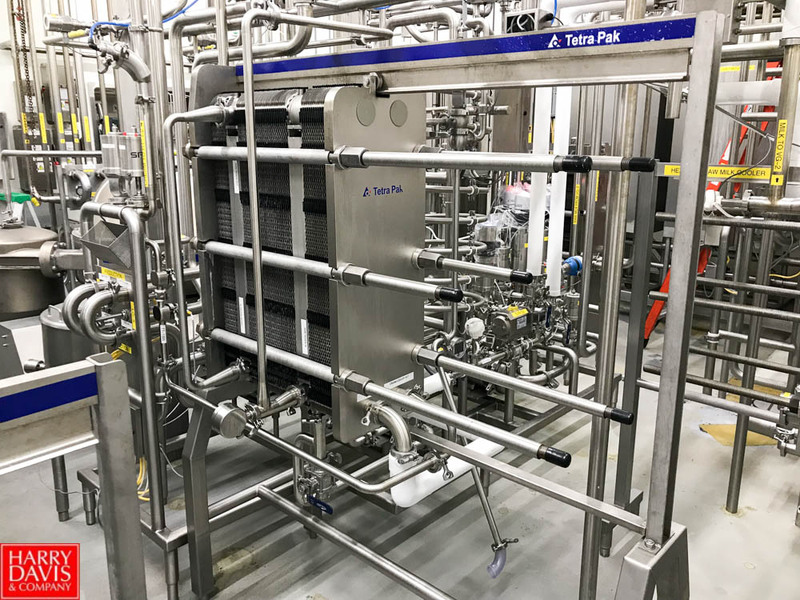 (6) AGC & Tetra Plate Heat Exchangers for Cooling Raw & Pasteurized Milk. Multitank CIP System with 250 Gal. Wash/Rinse/Reclaim Tanks, Valves, Shell and Tube Heat Exchanger, Waukesha 2065 Supply Pump, and Rosemount Conductivity Meter. Multi-Circuit CIP System With 250 Gal. 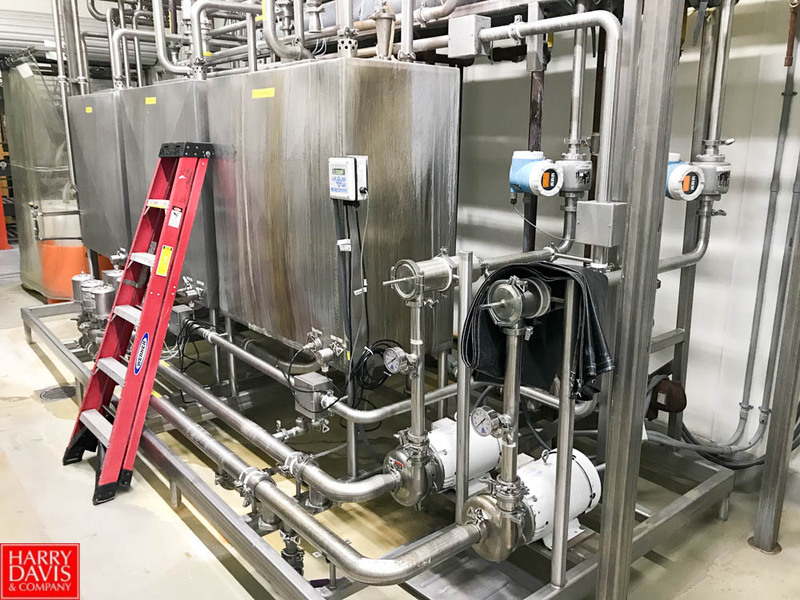 Wash/Rinse/Reclaim Tanks, Valves, Dual Shell and Tube Heat Exchangers, Dual Waukesha 2065 Supply Pumps, and Rosemount Conductivity Meter. 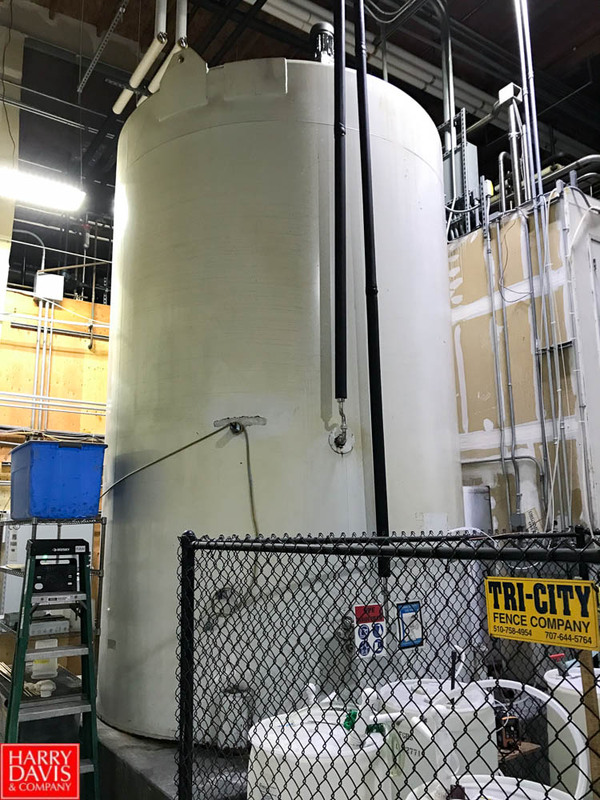 Multitank CIP System With 500 Gal. Wash/Rinse/Reclaim Tanks, Valves, Shell and Tube Heat Exchanger, Waukesha 2065 Supply Pump, and Rosemount Conductivity Meter. 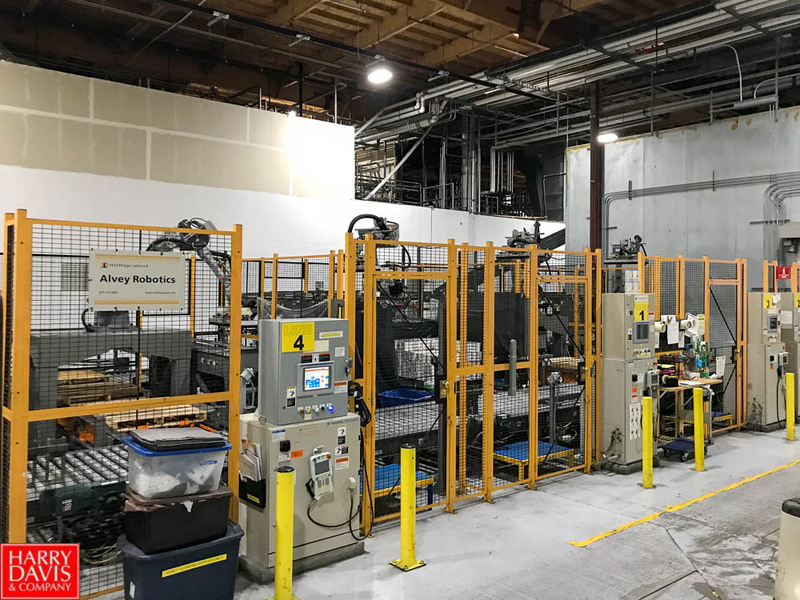 Line 1 – 2011 Modern Packaging SL1X4 – 4-Lane Large Cup (10, 16, 32 oz) Product Filling Machine with Cup Dispenser, Film Cutter, Heat Sealer, Lidder, and Definox CIP Valves – Filler Designed for 40 Cycles Per Minute; Delkor SP500i Spot Pak Rigid Case Packer Shrink Wrap Machine – Capable of Double Stacking with Delkor 25TW-28 SS Heat Tunnel, Side Film Loader, Nordson Problue 10 Glue Unit, and 90 Degree Turn Conveyor; Robotic Palletizing System with Motoman Model EPL-80 Robot with 176 Lb. Capacity, Motoman NX100 Controller with Memory For 60,000 Steps, 10,000 Instructions, Robot Work Cell, and Safety Fence. 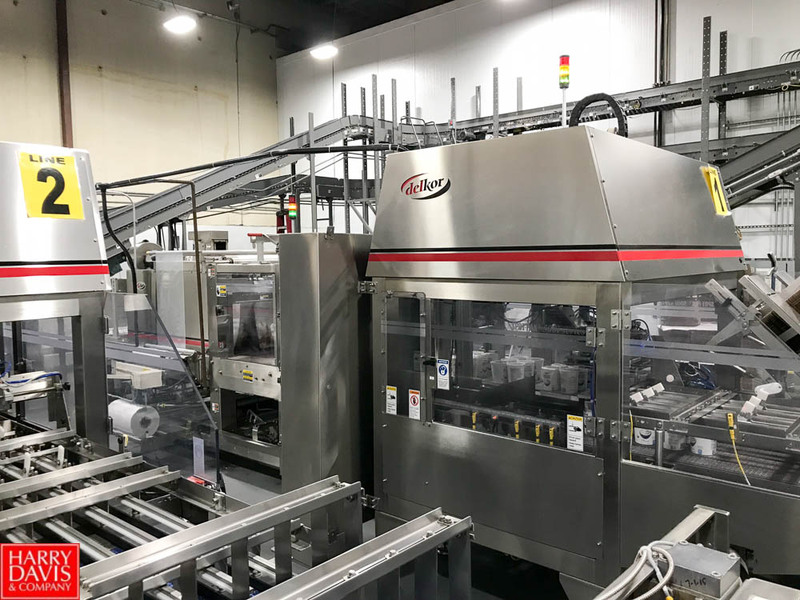 Line 2 – Modern Packaging SL1x8 – 8-Lane Small Cup (6 oz) Product Filling Machine with Cup Dispenser, Foil Placer, Heat Sealer, and Definox CIP Valves – Filler Designed for 40 Cycles Per Minute; Delkor SP500i Spot Pak Rigid Case Packer Shrink Wrap Machine – Capable of Double Stacking with Delkor 25TW-28SS Heat Tunnel, Nordson Problue 10 Glue Unit, and 90 Degree Turn Conveyor; Robotic Palletizing System with Motoman Model EPL-80 Robot with 176 Lb. Capacity, Motoman NX100 Controller with Memory For 60,000 Steps, 10,000 Instructions, Robot Work Cell, and Safety Fence. Line 3 – Modern Packaging SL1x8 – 8-Lane Small Cup (6 oz) Product Filling Machine with Cup Dispenser, Foil Placer, Heat Sealer, and Definox CIP Valves – Machine Designed for 40 Cycles Per Minute, Delkor SP500i Spot Pak Rigid Case Packer Shrink Wrap Machine – Capable of Double Stacking with Delkor 25TW-28 SS Heat Tunnel, Nordson Problue 10 Glue Unit, and 90 Degree Turn Conveyor; Robotic Palletizing System With Motoman Model EPL-80 Robot with 176 Lb. Capacity, Motoman NX100 Controller with Memory For 60,000 Steps, 10,000 Instructions, Robot Work Cell, and Safety Fence. 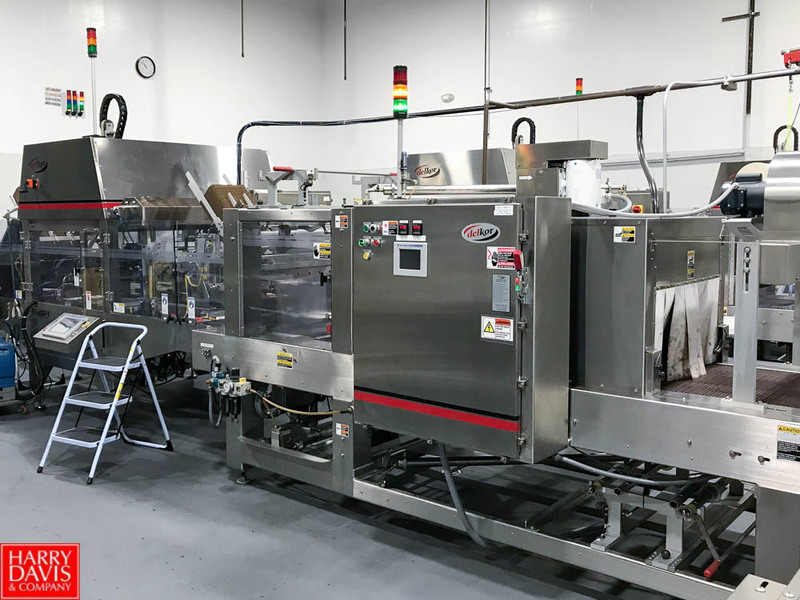 Line 4 – 2012 Oystar Autoprod FP1x8 – 8-Lane Single and Split Cup Product Filling Machine with Cup Dispenser, Prefiller Hopper, Filler Hopper, Foil Placer, Heat Sealer, GEA CIP Valves, and Fristam FZX 57.5 Hp Drain Pan Pump – Machine Designed for 40 Cycles Per Minute; Dynac 6400 Single File Accumulator with High Pressure CAT 7CP6110 Pump for Conveyor Cleaning; Delkor SP65Oi Spot Pak Rigid Case Packer Shrink Wrap Machine – Capable of Double Stacking with Delkor 25TW-28 SS Heat Tunnel, Nordson Problue 10 Glue Unit, and 90 Degree Turn Conveyor; Robotic Palletizing System with Motoman Model MPL-80 Robot with 176 Lb. Capacity, Motoman DX100 Controller with Memory for 60,000 Steps, 10,000 Instructions, Robot Work Cell, and Safety Fence. 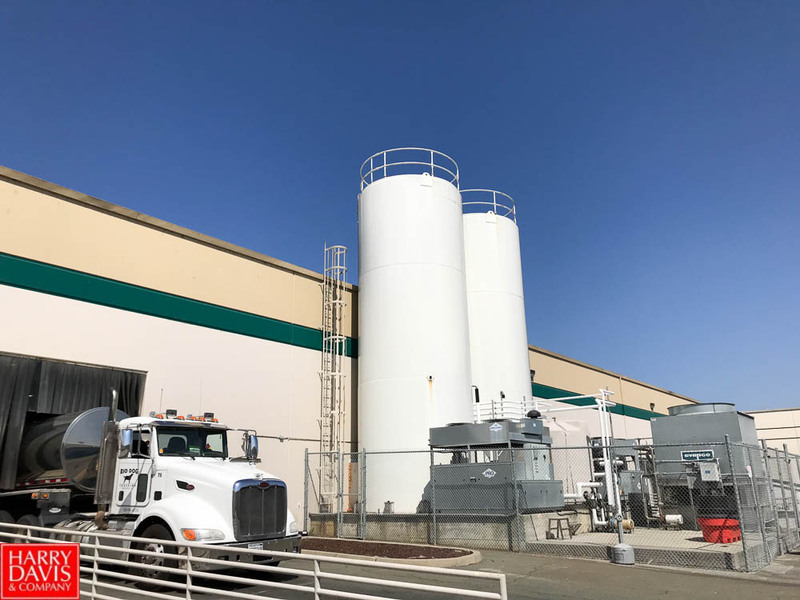 Line 5 – 2013 Pacific Packaging AF-501-NW 5 Gal. 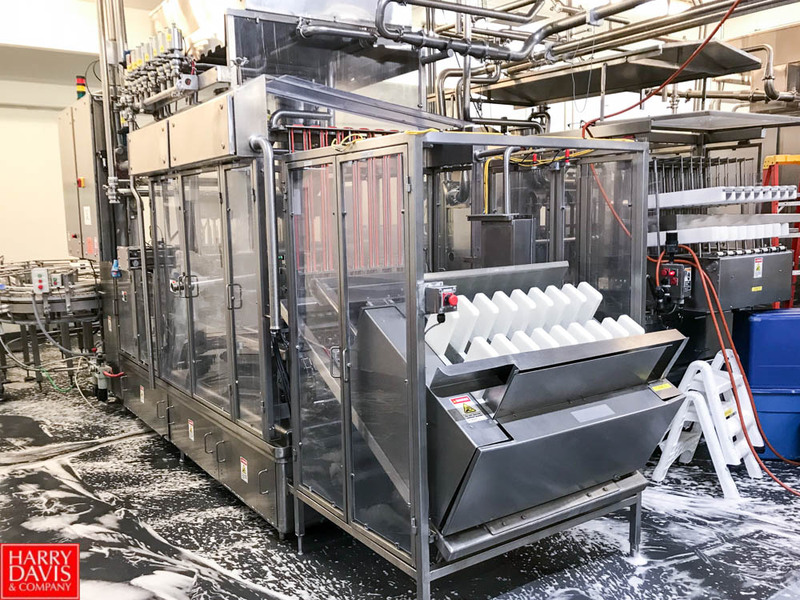 Net Weight Inline Pail Filler with Weigh Station and Lidder – Currently Running at 5-6 Pails Per Minute. 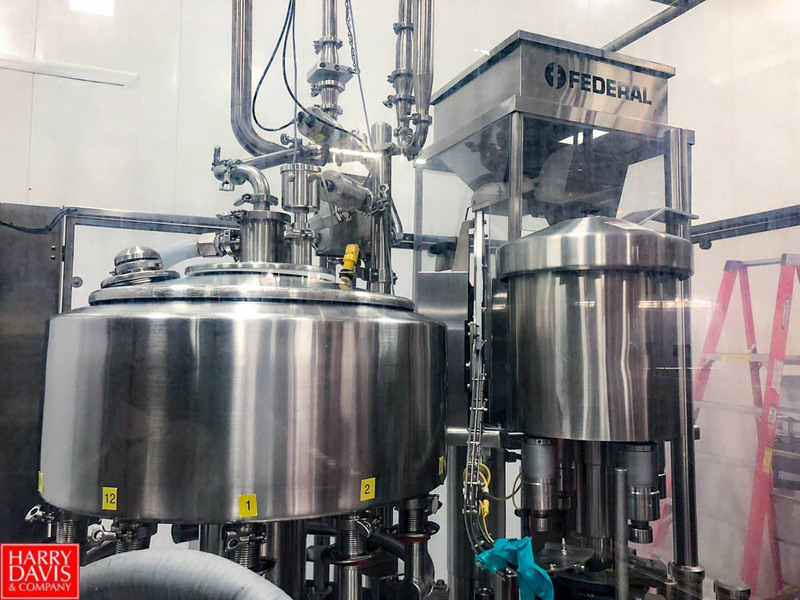 Line 6 – Federal Manufacturing 2386GWSS2 Rotary Bottle Level Filling Machine With Capper, Dyco Bottle Depalletizer, and Alfa Laval CIP Valves – Machine Designed For 80 bpm, Currently Running At 96 bpm. 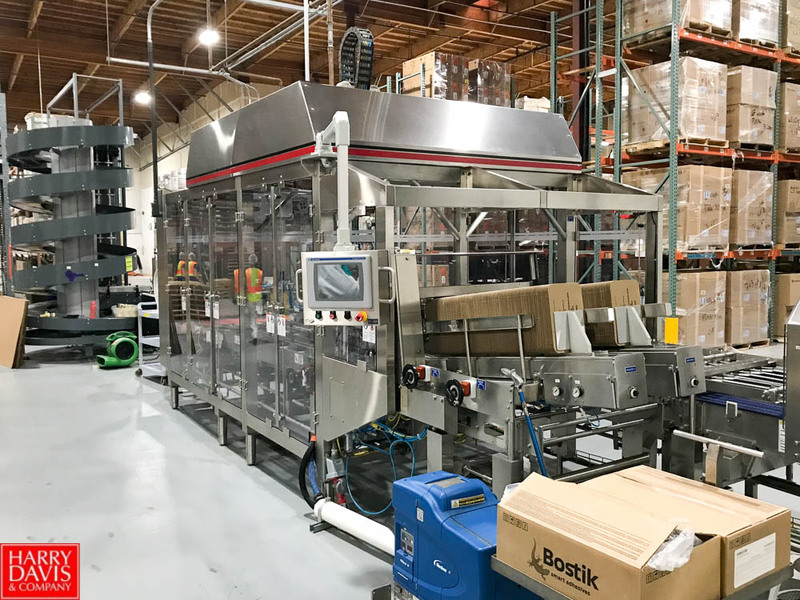 Tripak MSA 180 Automatic Shrink Sleeve Applicator with 4-1/2″ Stainless Steel Tabletop Conveyor with Timing Screw, Tamp Down Brush Add-On, Tripak ST 1 4.5 Steam Tunnel, and Sterling 4134-JX Condensate Return Pump; 2015 Delkor 48Oi Spot Pak 4-Wide Bottle Case Packer Shrink Wrap Machine – with Delkor 115-CSS-24 Heat Tunnel, and Nordson Problue 10 Glue Unit (2013). (14) Diagraph and Markem Cup, Bottle & Case Coders. (2) 3M-Matic 700A Adjustable Case Sealer with AccuGlide II Taping Heads for Uniform Sized Boxes – 85 Lb. Max Capacity, 24.5” Max Height, 21.5” Max Width. (2) Orion L66-17S Stretch Wrapper – 4000 Lb. Dynamic Weight Capacity with a 14 RPM 20″ Film Delivery System. Phoenix PLP-2150 Stretch Wrapper – 5000 Lb. Dynamic Weight Capacity with a 15 RPM 20″ Film Delivery System. Tanker Receiving System – Waukesha 2085 7.5 Hp Product Transfer Pump, Tanker Outlet Hose, Flowmeter, Sock Screen, and Waukesha Sanitary Valves. Saferack Safety Platform, Model: W/ G4-SAS Style Gangaway for Tanker Truck Access. (2) Pro Refrigeration Glycol Chillers, Model: PCAH2/30F12H22SP (760,000 BTU) with Pumps. Polyprocessing 2,500 Gal. 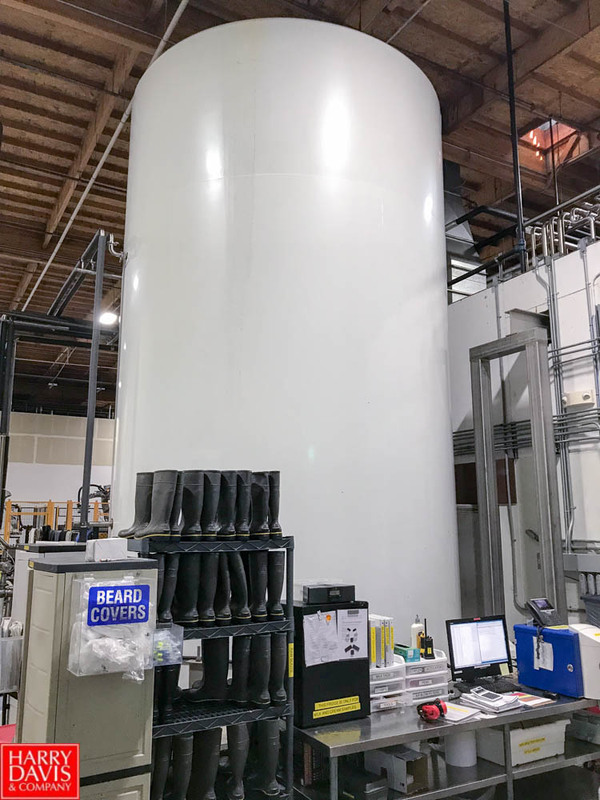 Glycol Storage Tank, Model: XLPE with Pumps. Evapco Closed Circuit Water Cooling Tower, Model: ATW644I2 with Goulds 3656 Tower Pump. Parker Balston HFX-5 Nitrogen Generator with O2 Monitor. Parker Balston N2-45 Nitrogen Generator. NEW Allen Bradley Powerflex 700 20BD096A3ANNANC0 Variable Frequency Drive. Miura LX-150Hp 170psi Max Pressure Boiler. Miura WX-65Hp 170psi Max Pressure Boiler. Boiler System Includes Approx. 480 Gal. Feedwater Tank, Grundfos CR2 and CR3 Feedwater Pumps, LMI and Walchem Chemical Pumps and Water Softener. 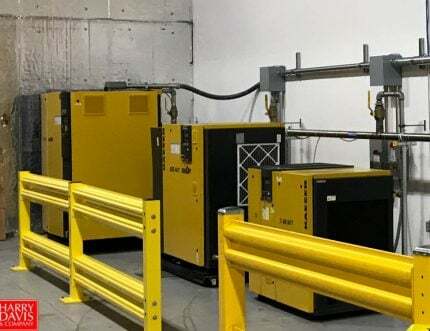 (4) Kaeser Screw Air Compressors with Dryers, Air Tanks, Filters, etc. 2016 Foss Milkoscan, Model: FT1 60045000 FTIR Liquid Dairy Analyzer – Tests for Fat, Protein, Lactose/Reduced Lactose, Total Solids, SNF, FPD, Total Acidity, Density, FFA, Citric Acids, Casein, Urea, Sucrose, Glucose, Fructose and Galactose. 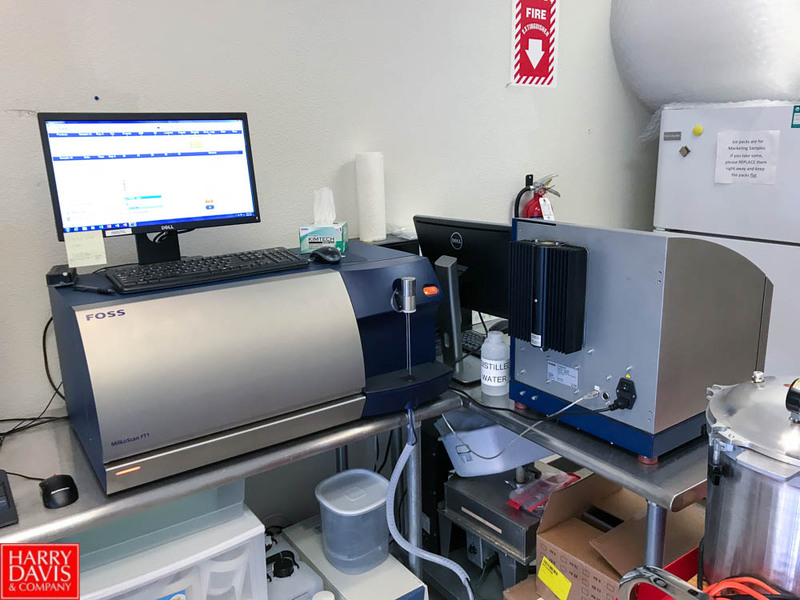 2016 Foss Foodscan Lab 60066161 FTIR Dairy Analyzer for Cheese, Whey Powder, Butter, and Yogurt Samples – Tests For Fat, Protein, Moisture, Salt, Solids, Non-Fat and Ph. Biolumix32 Rapid Test System for Yeast, Mold, or Coliform, Model: BLX-INS32R with Computer; 32 Samples per Test. 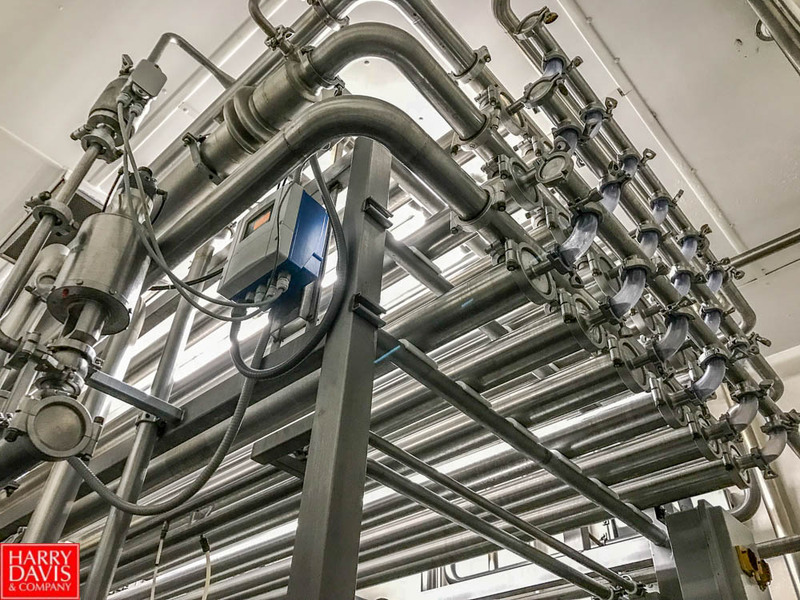 (3) Metron York Dairy Analyzer – Mid-Infrared Analyzer that measures Fat, Protein, Lactose, SNF and Total Solids with Post Rinse after sample. Sanyo MDF-U32V Ultra Low Temperature Laboratory Freezer. Sanyo MDF-U71VC Ultra Low Temperature Laboratory Freezer.